Note: The charts and data are as of Friday April 5, 2019. To enlarge please click on charts. World equities are on an upswing. 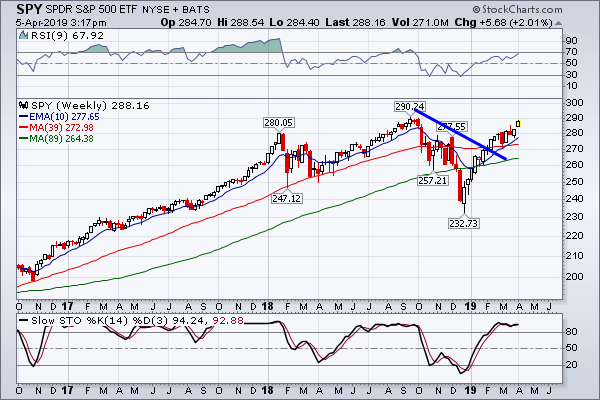 The S&P 500 stumbled a bit in the early part of 2018 and then again in Q4 too but since then it is rising consistently (see Chart 1) It is above its 10-week EMA, which has crossed over the 39-week SMA, which in turn is above 89-week SMA. The sequence of moving averages indicate uptrend. The index broke above a downtrend line in late January. Similarly, other international equities are also rising after having a terrible 2018, in which, unlike S&P 500, they declined in most of the months. However, by the end of the year their fortune turned up along with S&P 500. 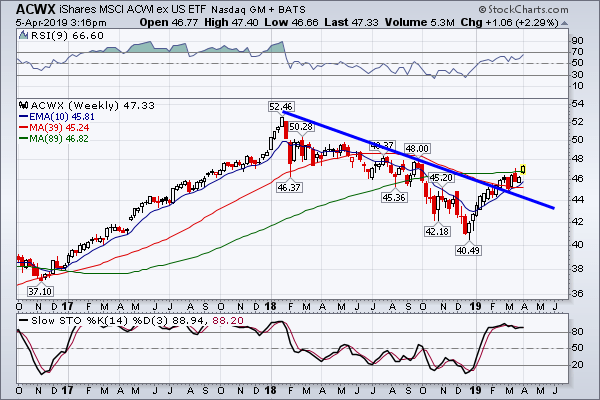 MSCI All Country World Index Ex US iShares ($ACWX) crossed above it 10-week EMA in early January and then crossed above its downtrend line in early March. the 10-week EMA crossed above 39-week SMA in late March (see Chart 2). Although both are below 89-week SMA, the uptrend, nevertheless, is gaining momentum. MSCI EAFE ETF ($EFA), a proxy for developed market equities, is just crossing above its downtrend line from 2018 high (see Chart 3). This indicates that the upswing, which started in late December, is showing promise. 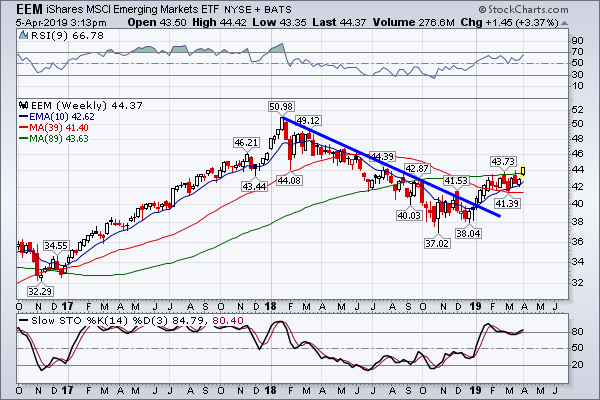 Emerging markets, $EEM, started to turn around earlier (see Chart 4). Its decline in December did not come near its low made in October, which was a sign of its bullishness. It also crossed above it downtrend line in December and is about to cross above it 89-week SMA. 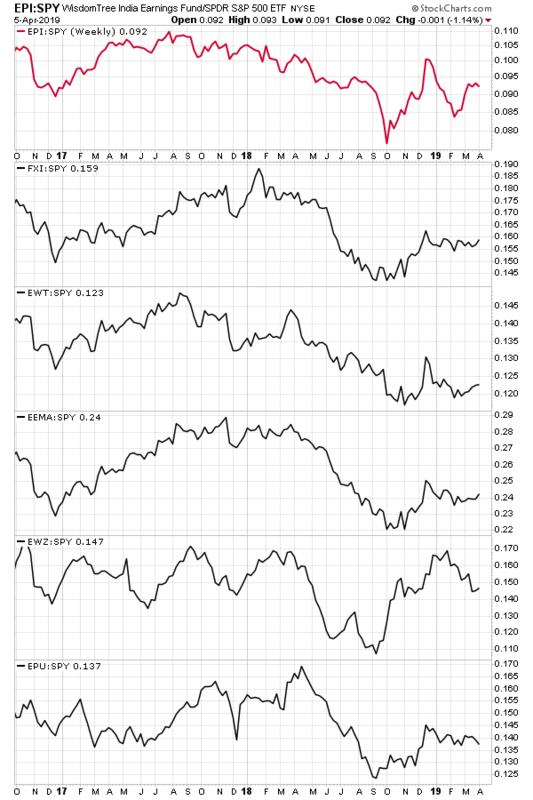 On relative strength basis, S&P 500 is outperforming these three indices (see top three panels in Chart 5). These indices briefly out-performed S&P 500 near the end of 2018 before the U.S. benchmark index took the lead. All are doing well relatively equally for the past few weeks. $EEM outperformed SPY from October 2018 to January and then since they are returning about the same with SPY maintaining slight advantage. 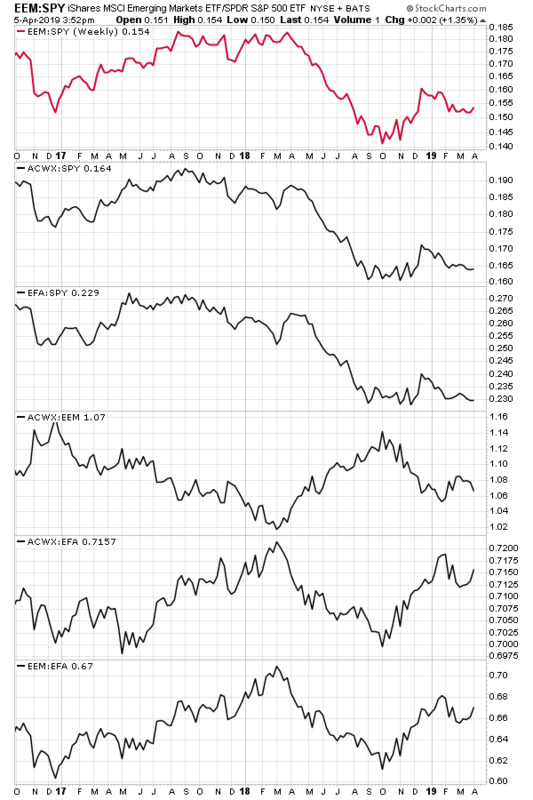 Amongst the other three non-U.S. indices, $EEM is doing the best followed by $ACWX and then $EFA (see bottom three panels in Chart 5). $EEM underperformed both during most of 2018 before turning the tables in the Q4 (see fourth and sixth panel). In 2018, $EFA performed better than $ACWX and $EEM (see fifth and sixth panel). The performance sequence, as on early April 2019, is $SPY, $EEM, $ACWX and $EFA. Even though the S&P 500 is outperforming combined emerging market ETF, $EEM, since the start of 2019, many emerging markets are doing better than the U.S. index. Indian ETF, $EPI, started to outperform $SPY from October 2018 after underperforming it for most of 2018. It lagged SPY for few weeks between December and February before retaking the lead (see first panel of Chart 6). Chinese ETF, $FXI, started to outperform SPY by the end of August 2018. Since December both are mostly maintaining similar returns (see second panel of Chart 6). The attempts of Taiwanese ETF, $EWT, to outperform $SPY fizzled in early January after only few weeks (see third panel of Chart 6). The Brazilian ETF, $EWZ, outperformed longer – from September to February – but it is again underperforming. The relative strength graph of Peruvian ETF, $EPU (sixth panel of Chart 6), and that of Emerging Asia, $EEMA (see fourth panel of Chart 6), are also like that of $FXI . The $EPU started to outperform S&P 500 in September and then since January both are doing equally well. $EEMA started to outperform $SPY in October before reaching equality in January. The Indian ETF, $EPI, was doing better than the Chinese ETF, $FXI, in the Q4 of 2018. Then $FXI took the lead before relinquishing it in late February 2019 (see first panel of Chart 7). $EPI is also doing better than Peruvian ETF, $EPU, and Emerging Asia, $EEMA (see second and third panel of Chart 7). $FXI is outperforming $EEMA (see fifth panel of Chart 7) and either matching or doing better than $EPU (see fourth panel of Chart 7) in 2019. 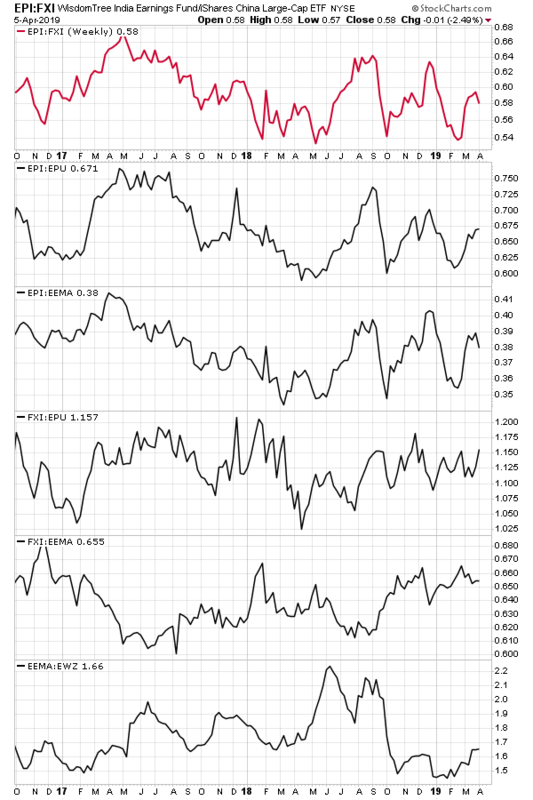 $FXI is clearly outperforming $EEMA (see sixth panel of Chart 7). $EEMA, for it part, is outperforming the Brazilian ETF, $EWZ (last panel of Chart 7). Though $EPI and $FXI are doing better than others the difference between them is not significant. Nevertheless, the performance sequence is $EPI, $FXI, $EPU, $EEMA and $EWZ.